Lockerly’s Horticulture Director, Debbie Foster, will lead a hands-on plant container workshop on Tuesday, June 14 th using a material called Hypertufa (hy-per- TOO-fa). 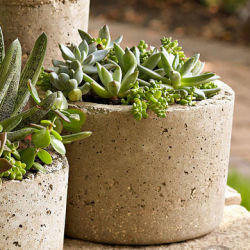 Hypertufa is made by mixing cement, perlite, and peat, which can be shaped into containers and sculptured forms. Containers can be made using a plastic bowl or cardboard box as a mold, or shaped to fit a design idea. Accent features can be added to a container, including colored glass or small pieces of tile. Hypertufa containers add a unique look to a group of potted plants. Lockerly’s workshop will be held from 9:30-11:00 on Tuesday morning, June 14 th at the Arboretum. Participants should wear shoes and clothes that can get dirty and damp. Registration is available online at lockerly.org/events. Friends of Lockerly may register for $12 per adult. Nonmember registration is $15 per adult. Children ages 6-14 may participate when accompanied by an adult at an additional cost of $7.00. This is a great opportunity for a child to make a Father’s Day gift. All the details are on our online registration page. If you prefer to pay by check please contact the office at 478.452.2112 or register in person at the Arboretum, which is located at 1534 Irwinton Road in Milledgeville. For more information please contact Debbie Foster at 478.452.2112 or email debbiefoster@lockerly.org.